The development of new components has always been the trigger to push PCB technology further up the ladder. Smaller and fine pitch footprints of SMT components challenge the PCB makers to achieve High Density Interconnections, higher pattern accuracy and improved flatness. Sometimes the PCB itself becomes an SMT component that shall be soldered to a bigger PCB, which will increase the requirements further. We can divide the root causes for bow and twist in two groups: Intrinsic and extrinsic bow and twist. Intrinsic bow and twist has been induced into the PCB during the lamination cure steps, and there are no corrective actions with permanent effect! Extrinsic bow and twist has been induced after the lamination cure steps, and corrective actions can be taken. 4) Breakaway area not matching copper distribution per layer. 3) Heat during solder mask or legend cure step. The copper pattern design of the break away area must mimic the copper distribution for each layer. A perfectly balanced break away area will move differently than the none perfect board itself and cause stress leading to a twist in the panel until we separate the PCB from the break away area. 2) Bake the boards 10 degr. 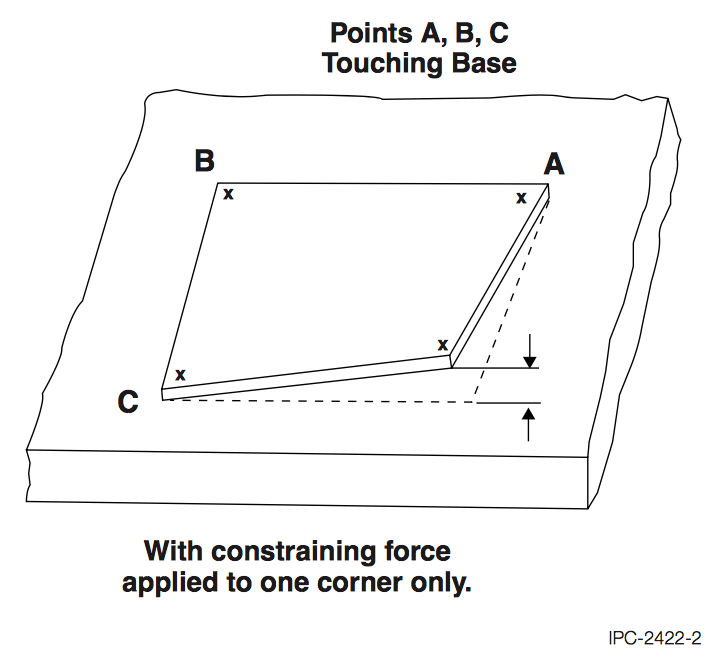 Higher than the material Tg for 20 minutes, flat, side by side with no pressure or touching. 3) Cool the boards to room temperature at 1 degr. per minute leaving oven door closed. 5) The delta of bow and twist is now the degree of intrinsic and extrinsic mix. Any between is a mix. How to measure Bow and twist? When we shall look into improvements of bow and twist exceeding normal tolerances, we need to review the intrinsic root causes, and tune both design and production related issues that could affect the performance. First of all, we have to control that all related production processes are in control. Then we need to review potential improvements in the production process that could bring the performance beyond standard expectations. The lamination is normally tuned to be cost effective and still meet specified tolerances. The pressing cycle can be tuned further by extended cycle times to achieve improved performance. The use of prepreg is a trade off between a customer specifications and the optimal choice for high performance. To give improved stability, the build must be 100% symmetric, and we need to choose the most robust prepregs and core constructions. The result will probably affect impedance that needs to be recalculated. Copper distribution must be optimised within each layer, and should be matched within the build. The build must be symmetric and all pairs of layers on each side of the build centre should have equal copper weight. (fig. 1). Most designs with high layer counts will have a tendency of low-pressure areas. This could be avoided by adding copper filling by dummy pads or cross hatched copper. Many PCB designs have so called split planes that may perform as a bend indicator line, especially if we have the same pattern in more than one layer through the build. The breakaway area is maybe the most neglected reason for bow and twist. It is essential for the performance that the copper on every layer of the breakaway area mimics the copper of the PCB itself. Bend and twist management for improved performance is difficult, and includes all the above-mentioned issues. It may require a number of sample runs to detect which if the actions that gives the required effect. In addition there are a number of actions that could be taken in the soldering and assembly process to improve flatness. Together with our professional manufacturers, Elmatica have the experience and knowledge to guide our customers to achieve better performance. For such issues you can contact your dedicated sales contact, who will request assistance from one of our application engineers. 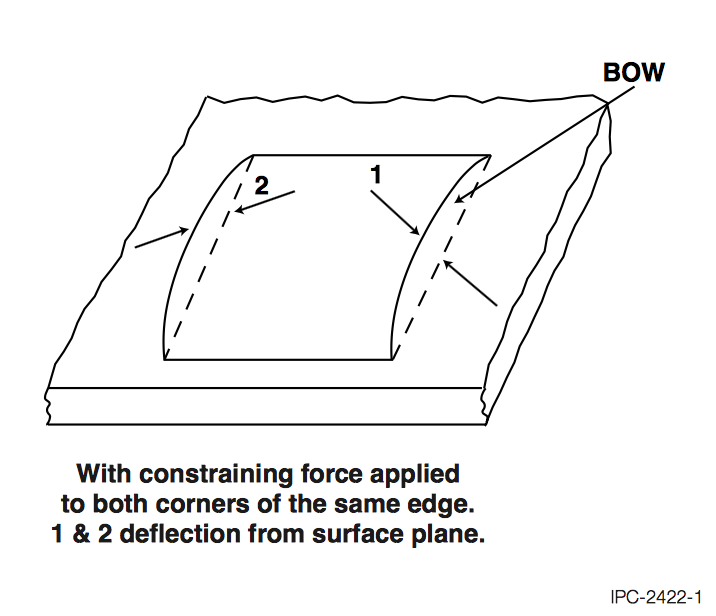 Take a look at the IPC-TM-650 test methods manual on how to calculate bow & twist percentages.